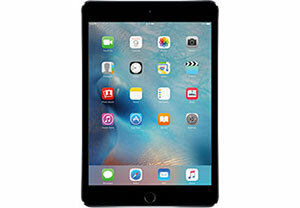 With a weight of just 0.65 pound and measuring 6.1mm thin, the iPad mini 4 is incredibly sleek. The A8 chip with second-generation 64-bit desktop-class architecture offers CPU performance that's 30% faster and graphics that are 60% faster compared to older models. And with Touch ID technology, you can unlock your iPad mini 4 and pay for apps using Apple Pay with the touch of a finger. The 7.9-inch (diagonal) LED-backlit Multi-Touch display supports 2048 x 1536 resolution at 326 pixels per inch (ppi), and the device itself has an 8MP iSight camera with 1080p HD video recording (30 fps). A FaceTime HD camera also supports 1.2MP photos, while the mini 4 has dual microphones for calls, video recording and audio recording. Two storage capacities are available (32GB and 128GB) in your choice of three finishes (Silver, Space Gray and Gold).